It’s been a week of surrender and boredom and humility! So many things come up. Small obstacles loomed large, giving me much more empathy for people that have handicaps or are impaired. Learning to ask for help when you need it and knowing for certain what your physicals limits are has been a huge lesson for me. After surgery, I had no pain. I’d had a nerve block, so my leg was essentially a lead weight. I was immediately put on three pieces of equipment, an icing pump that continuously circulates ice and ice water around the knee and leg, a continuous motion device that very, very slowly bends the knee at a certain rate and degree and a big knee brace that needed to be worn whenever I was up and about, (they called this ambulating!). Getting to a hotel,( my home has two steep flights of stairs before you reach a bathroom, not an option), with this equipment and setting it all up properly and quickly was a challenge for my mom and I. We did it though. I had to be on the motion device for the first 24hrs. and changing the ice out every four hours. We were diligent about keeping up this regime throughout Thursday and Friday. Come Friday night, I had a good friend take over for my mom. Good thing too, because it was challenging for her and she needed a break. Just as my friend arrived, so did the pain. The nerve block subsided and the party was over. I’ve never taken pain medication before but the surgeon advised not to try to ride out the pain, that it would be better for my healing to take it. So I did. Friday and the whole day Saturday was riding from very painful, (I still was on the continuous motion device, now a torture device), and blissfully dreaming in a drug induced warmth. Never having taken these types of drugs before, (I missed the sixties), it was an experience for me. Sunday morning brought relief from the pain. I only took one pain pill all day and a little Advil. I was amazed! I could even begin to put a bit of weight on it. Sunday was a good day. I actually got some sleep even though I was still on the motion and ice machines. Three hours on, three off ’round the clock. But Sunday brought some frustration too. The hotel had originally told me that I could stay as long as I needed, but upon calling down to say, I wanted to room for two more days, they told me they were completely booked. I had to move again. When I’d originally made the reservation, it had been tough, for whatever reason, most of the local hotels had been booked so I was worried I wouldn’t find another place. Fortunately I did. So Monday was shaping up to be a busy day. Mom taking me to physical therapy, and then moving to new digs. This time only for two days; a friend with an apartment with an elevator is going on vacation for three weeks and has offered her place to me while she’s gone. I can take the elevator and get to my studio for a few hours a days and be safe doing it. Before this offer, I didn’t really know where I was going to stay. The universe does provide. Monday morning was checking out of the original hotel and getting to physical therapy. It was the first time I’d been really out and about, so therapy seemed like a party to me. I’d been moving slowly around my hotel room, getting the hang of the crutches, and didn’t really realize that all along, I’d been able to put some weight on the leg. My therapist was optimistic and encouraging. I think so much of it is mental; learning to trust your body again. I have good range of motion and can pretty much stand on my own. Shawndee wants me off the crutches within two weeks; a good goal and ready for stairs in maybe 10 days. Much more quickly than I’d thought or read about. I can now move around home without the brace and use it when I’m in unfamiliar territory to protect my knee. I can be up an about which means I can spend some time in the studio this week. More from the studio later in the week. Hurray!! I really owe my progress to all the help I’ve had and to ice!! Ice, ice, ice. Now, what I really want is a hot shower! It’s the little things! What an ordeal! Especially with not being able to go home right away. So sorry you are going through this and sending positive and healing thoughts and prayers! 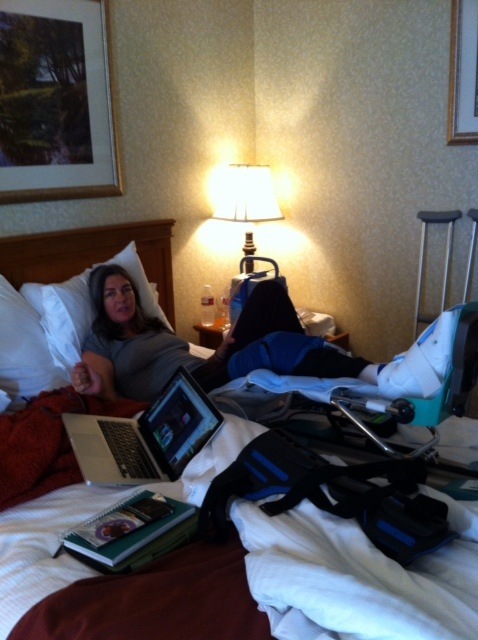 Oh, Miss Marla… Glad you're in recovery mode and seeing progress!